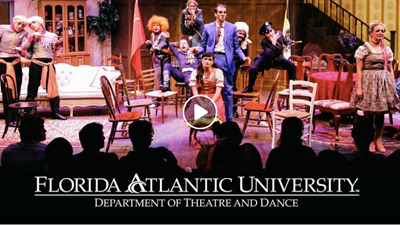 Located in sunny South Florida, Florida Atlantic University's Department of Theatre & Dance offers a variety of Graduate and Undergraduate theatre programs! On the graduate level we are the only school in the South Florida area that offers a Master of Fine Arts in theatre performance, or a Master of Fine Arts in theatre design and technology. Each program has been structured using a conservatory approach, and focused on taking professionals actors, designers, and stage managers to the next level in their craft. On the undergraduate level we have a bachelor of fine arts in theatre performance and a bachelor's in design and technology. Additionally we offer a bachelor's in general theatre, a minor in acting, and a minor in dance. We also offer a Musical Theatre concentration option for our BFA students. Our faculty is made up of seasoned theatre professionals who have had long and successful careers in their areas of expertise including: classical and contemporary acting techniques, voice for the stage, movement for the actor, musical theatre, stage combat, directing, playwriting, stage management, scenic design, costume design, and lighting design. Our performance facilities include a main stage where we produce four shows throughout the school year and two equity internship productions during the summer, and a studio theatre where our honor society, Alpha Psi Omega, produces four plays and a number of variety shows throughout the year. For more information about our programs, admissions, auditions, or to schedule a personal tour contact our theatre office today! ...training the Theatre of the Future!